I recently received a Newborn Diaper from GroVia Cloth Diapers to review. I was really excited because the cloth diapers that I use are pocket diapers which requires prep-work like stuffing an insert into the diaper. The diaper that GroVia sent me is an All-In-One diaper which requires NO stuffing! This is the diaper I choose- Newborn AIO Cloth Diaper in the Cloud color. Here is my little girl modeling her GroVia diaper. The thing I like the most about this diaper is the style and design. The diaper is SUPER trim- it is WAY trimmer than my pocket diapers. I also like how it goes BELOW my daughters belly button. That is crucial in a newborn diaper because of the umbilical cord. It even has snaps on the front of the diaper to make it go even lower if you need it to. The materials the diaper is made of are extremely SOFT, so nice for your newborns skin. The insert is made of 55% Hemp, 45% Cotton topped with 100% Polyester Microfleece which is extremely trim yet very absorbent. This is the perfect diaper for husband or grandparents who are new to cloth diapering. You just snap the diaper onto your newborn and you are good to go. It is extremely easy and there is NO stuffing, NO pins and NO covers needed! I have used this diaper for about one month now and so far it has held up VERY well. It looks NEW! I have not had one stain which is very important to me in a diaper! The durability of it seems to be great! This is my first child that I have used cloth diapers for. I have been completely shocked about how well cloth diapers hold in messes! 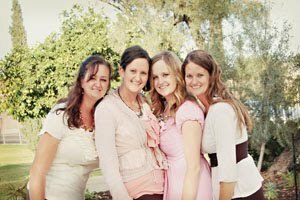 It seems like with my other two children I was constantly cleaning up HUGE blowouts and going through Spray-N-Wash constantly. Since I have have been cloth diapering I have really only had one blow out. I LOVE how well they hold everything in! It is 100% better than disposable diapers! 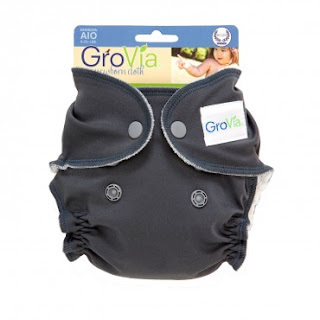 This GroVia AIO diaper is no different. It holds everything in very well and I do not have to worry about those HUGE messes everywhere! I really surprised myself when I started cloth diapering. I started doing it because I was completely tired of constantly having to buy disposables. I am SO happy that I did! I LOVE it! If any of you have any questions for me about cloth diapering, just let me know and I will try to answer them. If you are looking for Newborn Diapers- GroVia Cloth Diapers are a great option! My little girl LOVES them! Hubby and I are planning to start our family sometime next year... And I've been interested in loads of cloth diaper research. Ths was a great product review.. And that last picture just about melted my heart! 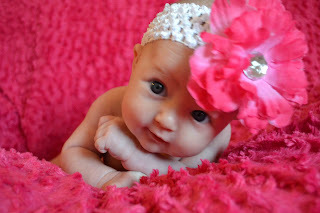 :) what a cutie!